5 Things You Should Know Before Watching #GlobeColdplay - Hello! Welcome to my blog! Globe Coldplay is only a few days away, and people are getting excited for the much-awaited concert of the year. Coldplay dreamers have waited for this day to come, and without a doubt, they are in for an adventure of a lifetime on April 4, 2017 at the Mall of Asia Concert Grounds. Here are 5 things you should know before watching #GlobeColdplay! Since Coldplay is just a few days away, sing your heart out with a dedicated playlist on Spotify. Here’s the link:glbe.co/ColdplayFavorites. You’re welcome! 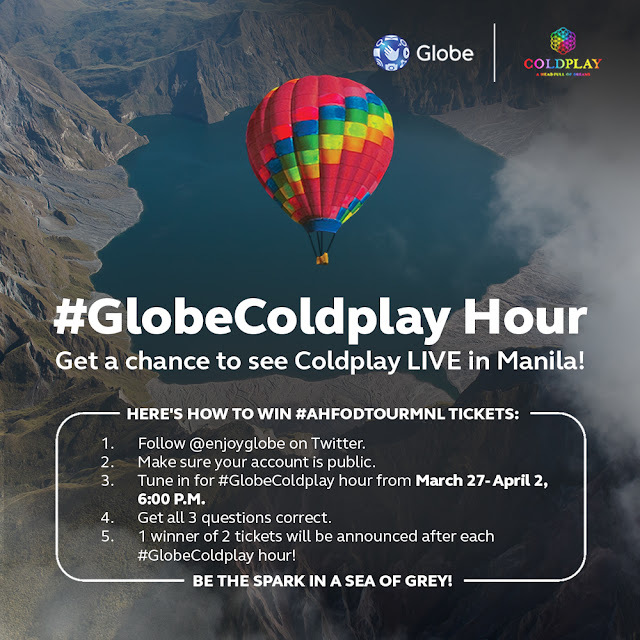 Set your clocks for #GlobeColdplay Hour! Every day until April 2, at 6:00 PM, Globe Telecom will give out “A Head Full of Dreams World Tour” concert tickets to lucky Coldplay dreamers through @enjoyGLOBE on Twitter. This England-born 22-year- old singer/songwriter/guitarist is ready to warm up the stage for #GlobeColdplay. From her Album My Name Is Jess Kent, and with her breakout hit “Get Down,” Kent brings her melodic tunes to Manila as an opening act. Globe Platinum VIP ticket holders will have their own lounge during the concert with refreshments and comfortable couches where Globe Platinum VIP ticket holders can enjoy the concert. IMAGINE SINGING COLDPLAY SONGS WITH 30,000 PEOPLE! Sing your heart out with 30,000 people to songs from “A Head Full of Dreams”. Can you imagine singing “Fix You” in unison? If this doesn’t excite you, then we don’t know what will! For more #GlobeColdplay updates, follow Globe Telecom on Facebook and @enjoyGLOBE on Instagram and Twitter.